On Tuesday, 10 April, we participated in the events at Campus UAB. We received two groups of secondary school students, who visited some of our labs and could learn some of the properties of our nanomaterials. The first visit, from 9 to 10 am, we had students from "Escola Sol Ixent" (Mataró) and from Olesa de Montserrat, who visited the X-ray diffraction lab, with Anna Crespi and Joan Esquius, the AFM lab, with Andrés Gómez. The second visit, from 12:30 to 1:30 pm, a group of students from "Col·legi Cor de Maria" (Valls) and "Institut Baix Empordà" (Palafrugell), listened to a seminar from Arantxa González on nanomaterials, and then visited the X-ray diffraction lab, and the electron microscopy, with Judith Oró. From 10:30 am to 12 pm, the students joined together at the UAB conference room, for a seminar introducing nanotechnology, given by Dr. Júlia Lorenzo (IBB-UAB), and to a roundtable, in which they could ask questions to "a future nanotechnologist". Judit Tomsen, from the NANOMOL group at ICMAB, participated in this roundtable, giving advises on the young students about being a PhD in nanoscience. Also, on that day, Anna Roig gave a seminar at CosmoCaixa on "Nanoparticles that reach the brain" and then participated in the NanoInventum final, in which she evaluated and talked with the primary school students who had created nanorobots. The experience was amazing: "we really enjoyed our time with the kids", says Anna Roig, who participated in the event with Laura Lechuga, from ICN2. 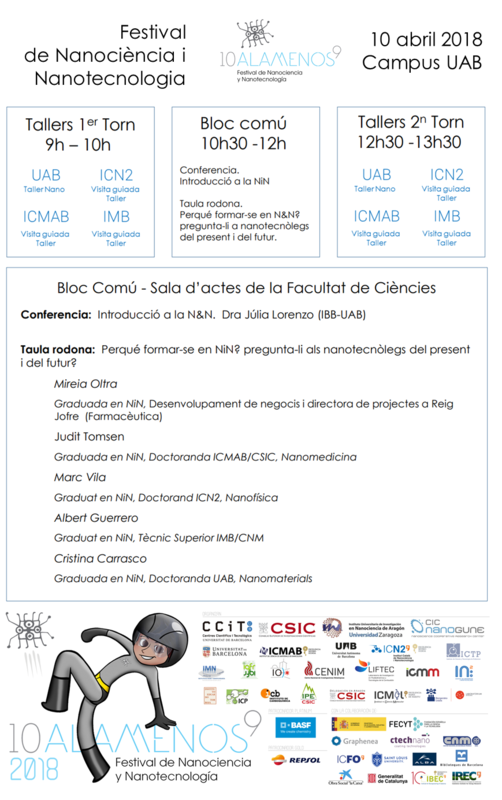 On Thursday two of our researchers gave to nano-seminars in CosmoCaixa. During that day, all the speakers were women, to visibilize the women working in nanoscience. From ICMAB, Cornelia Pop, from the Superconducting and Large Scale Nanostructures group, gave a talk on "Superconducting materials", and Stefania Sandoval, from the Solid State Chemistry group, gave a seminar on "Carbon-based nanomaterials". On Friday we met with some of our neighbors from Campus UAB and from Barcelona, Zaragoza and Madrid in the so-called "IV Encuentro Nacional de Nanodivulgación". The organizing team was formed by Jordi Díaz, from CCiTUB, Gemma Garcia, from UAB, Àlex Argemí and Ana de la Osa, from ICN2, and Anna May, from ICMAB. Participants came from CSIC (Madrid and Barcelona), INA, Escencia and IPE-CSIC in Zaragoza, and SCN2, Divulcat, UAB, CCiTUB and Eduscopi, in Barcelona. The meeting started with a morning session participative session generating idees for nanoscience outreach projects, organized by Salva Ferré from eduscopi. More than 1500 ideas were generated! And in the afternoon some of the participants presented some of the existing projects, or ideas for future projects. Anna May, from ICMAB, presented the recently FECYT-awarded project called "MATHEROES: supermaterials of the future". All in all, in Barcelona, the festival included more than 50 seminars by experts in nano, around 20 workshops, with more than 1,000 participants. In total, in Spain, more than 10,000 participants have participated in the festival, with more than 150 researchers involved and more than 30 research centers and universities.